Several Democratic lawmakers expressed sympathy for Internal Revenue Service employees Friday who must now carry the “stigma of corruption” in light of the agency’s recent scandal. While lawmakers from both sides of the aisle spent most of the time at the Ways and Means Committee hearing probing and criticizing IRS officials, some Democrats took part of their time to praise the agency and its workforce. 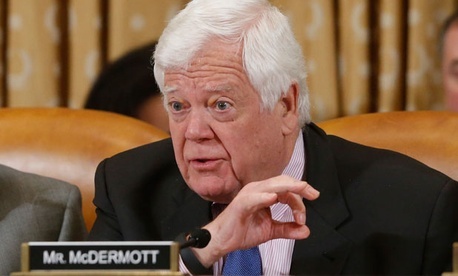 Rep. Jim McDermott, D-Wash., acknowledged some IRS workers “screwed up,” but said overall the agency’s employees are good people with tough jobs. Rep. Charlie Rangel, D-N.Y., expressed concern for the impact this scandal will have on the IRS workforce. He added that clearing the names of the IRS employees “who work hard each and every day” will help the entire government. “It’s not too late for the government -- it’s too late for the Congress -- but it’s not too late for the government to try to get its reputation cleaned up for America,” Rangel said. While most representatives continued to bash the agency, Rep. Xavier Becerra, D-Calif., echoed Rangel’s sentiment that the IRS must work to restore the faith of the American people in the tax collector’s workforce.